From outer space to Capitol Hill, from the silver screen to YouTube, the legendary George Takei has blazed his own trail while conquering new frontiers with a beaming trademark grin. Oh, my! 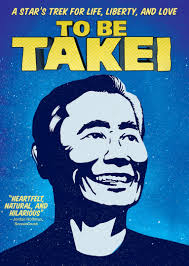 To Be Takei is a hilarious, entertaining, and moving look at the many roles played by eclectic 77-year-old actor/activist George Takei. His wit, humor and grace have helped him to become an internationally beloved figure and internet phenomenon with 7-million Facebook fans and counting. The film offers unprecedented access to the daily life of George and his husband/business partner Brad and chronicles George's fascinating personal journey from Japanese American internment camp to his iconic and groundbreaking role as Sulu on Star Trek, and his rise as an pop culture icon. The film shows what it truly means to be Takei. Featuring interviews with the cast of the original Star Trek, the new Sulu John Cho, and more.